As we noted earlier, University of Michigan Consumer Confidence beat expectations but fell sequentially, further retreating from the highs set back in March. While the underlying index has drawn down a bit, some underlying details were extremely strong. 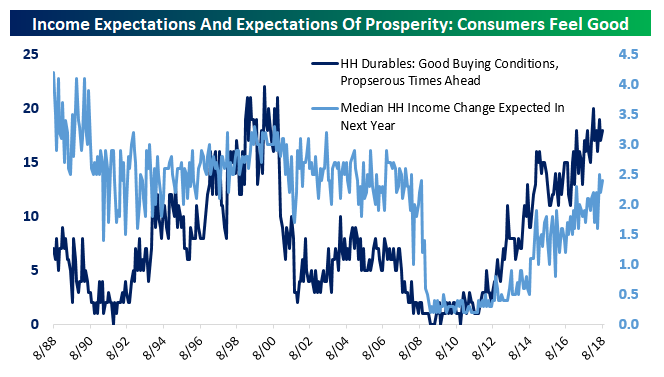 As shown in the chart below, a rising share of consumers report buying conditions are good because they believe there are prosperous times ahead. It’s easy to understand why when we also look at the median expectation for income growth in the next year: 2.4% and rising quickly. We note that both of these indicators look very different from the last expansion, when income growth expectations slowly trended lower and a much lower share of households reported good buying conditions thanks to expectations of prosperity.